Our Bunny cufflinks in sterling silver with blue sapphire eyes make the perfect groomsmen gift, Father’s Day gift, birthday present or anniversary gift for anyone who loves cufflinks. 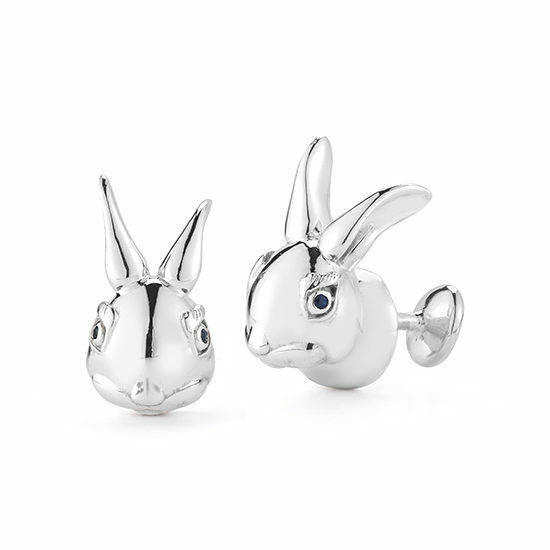 Gender neutral, these cufflinks are perfect for any rabbit lover in your life. Created by Haute Jewelry designer Douglas Elliott for Marisa Perry Atelier, a luxury jeweler in New York City’s West Village. These cufflinks are hand crafted by a master jeweler in Sterling Silver with Sapphire eyes burnished into the metal by a master stone setter. All crafted in Marisa Perry’s New York City workshop. These bunny rabbit cufflinks are custom made to order. Please allow three weeks from the time of order for these cufflinks to be complete. Ships In: Please allow 4-6 weeks to ship.